Once upon a time, a wise and generous king was reigning his vast and fertile lands. His people were the happiest all around, and so they worshipped their leader celebrating dissolute festivities in refreshing regularity. In order to grant the highest pleasure to his brave headbanging soldiers and high-heeling brides, the king was sparing no efforts and was always trying to invite the best musicians around at his court. Standing at his balcony, he sunk down in contemplations of his people going into ecstasies. Finally, he ended up meditating upon the golden era, he and his people were honored to live in. Founded in 2000, HIGH HEELER spread their vision of a pure Heavy Metal band ever since. With deepest devotion they commit their skills to a higher cause – the creation of tempting overtures of steel, meeting both, the highest musical and lyrical claims equally. 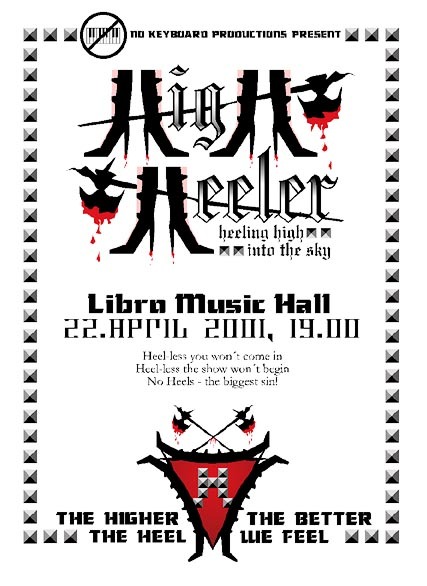 With a strong focus on performing, HIGH HEELER‘s increasing popularity led to powerful shows with Heavy Metal’s crème de la crème: GRAVE DIGGER, LIZZY BORDEN, HELSTAR, VICIOUS RUMORS or HEATHEN to name a few. 2005 saw the release of the »Power to the Chord« demo, accompanied by the »Plug in the Axe« live-tape. 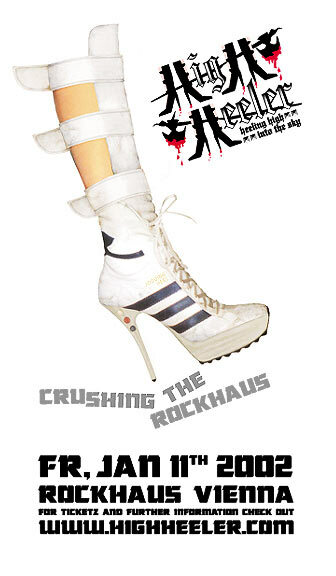 HIGH HEELER‘s hand-crafted steel, ripening in the heeling cellars like good wine, culminated for the first time in the release of the well received 2011 debut EP »12 Inch Heels«, self-released and spread all over the world. After great response following the EP – and continously expanding their repertoire of high-class material - HIGH HEELER decided to take on the endeavor of recording a full-length album. Starting the process in 2013, the project was successfully completed in summer 2015 - not before HIGH HEELER co-founded the AUSTRIAN HEAVY METAL ALLIANCE together with other like-minded bands and released a vinyl-compilation on Austrian Label "THE DOC'S DUNGEONS". Right after finishing the album, a deal was signed with SWORDS AND CHAINS RECORDS USA for the CD-release of "FORCE AND FINESSE", while the vinyl version is released by the band themselves. HEELS ARE MADE TO MARCH! The higher the heel, the better we feel. Heeling high - into the sky. Throughout the early days of their career, High Heeler kept record of some of their impressions - here they are. The very first and although the most brutal HIGH HEELER live performance until today. Spitting into the faces of this poser-assembly turned the stage into a boxing arena. of jury-points, only those who joined the devastation will ever understand. price, a Sennheiser Microphone, for the superior strenght of their crowd, in fact 39.
faithful Heel The World Crew. infamous Poison Poser and the brotherz through many long nightz, LOS DEEPEST. was drunk in the end and the Heelers hoised their sails again to reach new Shores. and, for the first time in history, served their meantimely neckbreakin’ classic, Steeletto Attakk. two Chief-Roadies of the Heel the World Crew, Josy Coyote aka Gim Tonik and DeeDee Himalaya. the backstage-Heeling Spirit and the on-stage-action straight to your cracker-jack living room. into Ashes and, as a second novelty, for the first time in history got payed for drinking and rocking. the fitting keyz for the their fazt carz). the evening like it began: With a beer in their Hands. was ready to strike again and this time we chose the Vienna Shelter as our battleground. Spirits seemed to turn their back on us. and finally flattened the battlefield with their Tank called "Steeletto Attakk". but not least- their Fans, who slowly seem to realize what it's all about. Heeling Mass had to pass a tremendous abyss of whimpdom, before the holy Heeling Spirit could finally emerge. you should check out this announcement. 22.10.2005, "SWARMING BACKSTAGE" at the Backstage Café, with NO.WAY!